DARPA wants to out-Star-Trek the Trekkies and create the kind of flight deck it reckons it'll need to cope with a future when hostilities could extend to space. The problem, the US military's blue-sky skunkworks says, is that there's already too much stuff in orbit (most of it junk). The high-tech-looking rooms full of screens you see in a televised rocket launch are, in fact, obsolete. 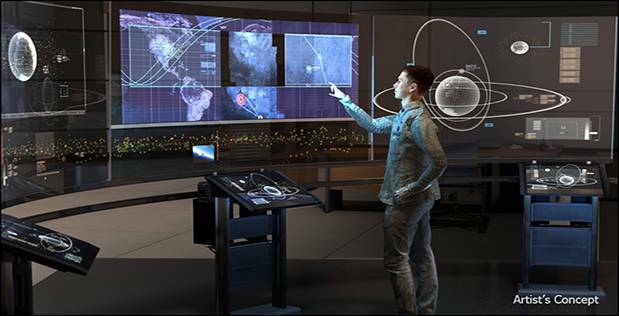 As DARPA says in its “outreach”, the thousands of objects ranging from the predictable geostationary satellites, low-earth-orbit constellations, and way too much junk, are a tough challenge for “commanders overseeing the nation’s increasingly critical space assets”. So it's kicking off its search for a new way to gather, manage, and present situational data to commanders, in a project dubbed the Hallmark Software Testbed (Hallmark-ST). To add spice to the project, DARPA wants the platform to ultimately support “tools and data sources at multiple levels of security classification”. In the longer term, DARPA would like to deploy the systems into a long-term testbed, the Hallmark Space Evaluation and Analysis Capability, which it hopes to set up in North Virginia.